Based on a manga by Tanimura Hitoshi, serialized in Comic Burger. 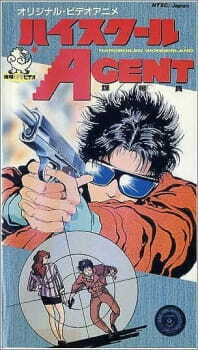 Teenager Kanemori Kousuke is a secret agent for the international VN spy network. Using his computer hacking skills, he tracks international criminals. Later he goes after Neo-Nazis to the Arctic were they try to raise a U-boat with a sinister secret. Kousuke is just your average high school student...but with a secret. On the weekends, he jets off around the world as a super-secret spy! How can he manage to balance his James Bond missions with homework? (Example: He is ordered to head off to the Arctic Ocean to recover Hitler's secret gold, but that would mean missing out on his date with way-above-his-league-girl at Disneyland. Oh, and don't forget to finish that English assignment for class on Monday!) Wacky hijinks ensue! Well, that's the idea, anyway. It would be best advised not to think too hard about the impossibility of the scenario, and how un-spy-like he acts. Adhering to strict reality is not the point of this OVA, but rather the point is to put a wacky high school student in these high-action scenarios (think as "viewer insert character") and watch him live out the fantasy. Or, once again...that's the idea. Only problem is: they really did a terrible job trying to meet up with that story concept. The artwork and the animation are second-rate *at best*. The main character is utterly hopeless: he's not very bright, he's not very competent, he's brash and a little annoying, not good at following instructions, he's hopelessly naive -- in short, your average, everyday teenage boy. Always getting his neck saved by his minder (who also happens to be his teacher, wink wink), Kousuke is actually a terrible spy, even by the low standards set in these two stories. Seems to me they were trying to set this up as a recurring series that never got off the ground. And just as well, because this forgettable little non-gem should remain forgotten.